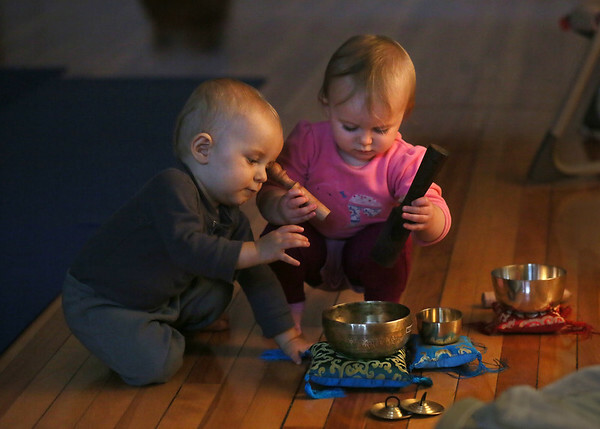 One-year-old Victor Corey, left, and 15-month-old Penny Mercurio play with Tibetan singing bowls during a "Sound Healing Chillout" for babies and parents Thursday at Floating Lotus in downtown Gloucester. The weekly event, led by Silvie Lockerova, gives children two years old and younger an opportunity to socialize while exploring a wide variety of musical instruments from around the world. The group meets every Thursday from 10 a.m. to 11:30 a.m.